If you are interested in mathematics and graphs then you may find Crispy Plotter a very useful tool for you. 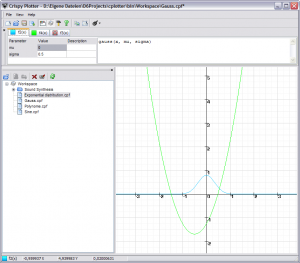 Crispy Plotter is a simple freeware utility which can be used to show you the graphs of mathematical functions. There are many built-in functions which can be used to plot the graphs or you can even create your own functions. With Crispy Plotter you can plot up to 12 graphs in a single coordinate system. The easy to use, simple interface will definitely attract your attention. The graph plotting speed is also very good. You can even export the generated graphs to image formats and use them in other applications. You can export the Images to BMP, EMF and SVG formats. Moreover you can use WaveOut plug-in to use Crispy Plotter for sound synthesis and FileDump plug-in to dump function values in a file.